7.24 points at 17 votes (rank 287). 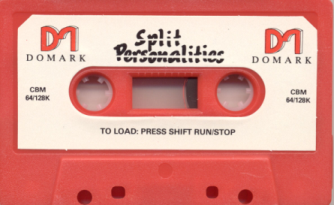 Split Personalities is a mixture of puzzle and skill game by Domark from 1986. The task is to solve a sliding puzzle under time pressure and at the same time combine bonus items and deactivate dangerous bombs. Who does not know the small sliding puzzles that you get as a giveaway from your bank or as a booby prize at the lottery booth at the fun fair (although you originally wanted to win the oversized purple plush teddy, so that you finally have some piece and quiet, because the girlfriend/children/voices in the head whine on about it!!!). Not only did the puzzles constantly tilt, no, once done they were most of the time assigned their final taks (trash can) or thrown into the hat of the next street musician. And deservedly so. 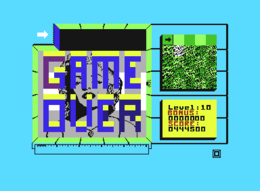 Well done: this level is finished. By the way: Did you know, that the "Iron Lady" has helped to invent the soft serve ice cream? Split Personalities works similarly: A field the size of 5X5 which at the beginning is completely empty will be filled bit by bit with puzzle pieces that you need to align correctly, so at the end you will see the portrait of a more or less popular celebrity. So that it is really fun, there is a rather hard time limit as well as a number of meanies that are added in the higher levels. 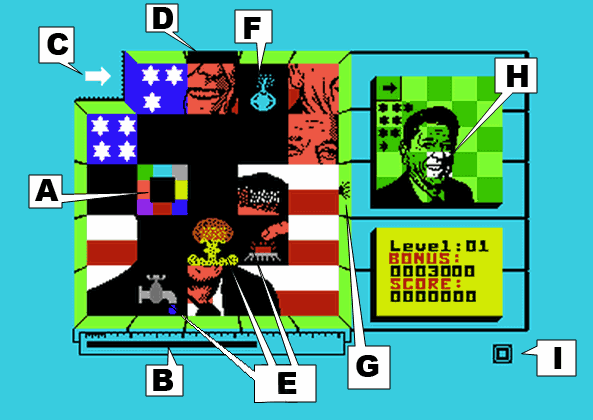 The player moves his cursor over the game area by joystick and can then move the puzzle parts after his will while pressing the fire button. However, only one piece at a time can be moved and it always moves as far as the rim of the game area or until it is stopped by another piece. If you make it to align the puzzle correctly, the rest time is converted to bonus points and you will of course continue with an even harder difficulty. Ronnie Raygun presents itself to us as an awful mess of Stars'n Stripes, bombs and mushroom clouds. A: This is the cursor, the player can move it. Later the player mutates to be a "curser", because one can swear so nicely in this game. B: That is the time bar. It is always too short and when it has run out this is not so good. C: Here, the new puzzle pieces emerge. No, not by themselves! You first have to place the cursor on it and press the button, you wally! D: Same as some of the ones displayed, the game area is not quite all there. Holes open periodically by which the puzzle pieces can be put away again. Sometimes this happens unintentionally (s. above "curser"). E: These are bonus items, which create bonus points and other great effects if you put them together correctly. But sometimes not, this depends on it. G: If you push a puzzle piece against such a crack in the wall, the part is spectacularly pushed away by an electric charge. H: The finished image should look like this. The white marked block shows the correct position of the last touched puzzle piece. This is utterly helpful. I: These are the screen lives left (including the on used at the moment): so one. J: HAHA! Got you! There is no "J"!!! LOL! ROFL! LMAO! 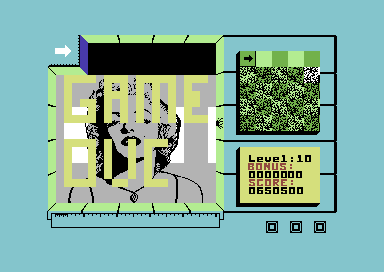 A slightly spectrum-like hint whiffs around the graphics of the game, which is due to the high resolution graphic mode and the colour clashes involved with this. The faces of the celebs are all, however, well recognizable, the rest of the game area on the other hand is kept almost aseptically functional and can do without any further decoration. David Whittaker contributes a peppy-fatching even though rather short title melody, as well as some dramatic jingles. In the game itself the effects dominate and they consist mainly of the nervous pulsing sound in the background, the mop-like squeaking when pushing the parts and electrical crackling noise when you touch one of the sparks. All in all a rather distinctive soundscape. Next to the normal puzzle pieces the game spits down also bonus items onto the game area to its whim. The player then quickly has to make a choice whether he immediately removes it through one of the holes to save space or if he wants to aggravate the sorting of the parts artificially to get bonus points for it. These points are not added immediately, but only after finishing the level successfully. Bonus items block the moving direction of pushed puzzle pieces in the same way as normal pieces do. But they dissolve as soon as they collide with another bonus item (exception: bombs!). There are bonus items that can appear in every level and level-specific items, which have a relation to the displayed person. So e.g. you will be rewarded in the Ronald Reagan level for bringing together the "Stars and Stripes" with hammer and sickle, and the "red button" with the mushroom cloud ("God bless America!"). To extinguish the bomb with the faucet gives you full 5000 bonus points, but it is a risky manoeuvre which can easily go wrong. If you put two diamonds together you get up to two minutes extra time. Gun and ammunition double the already collected bonus points. You put together fuel and match only if you want to lose a life. 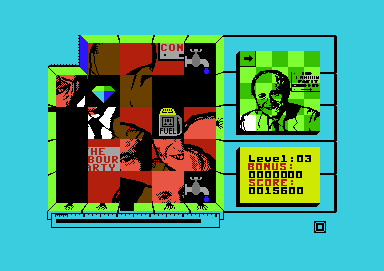 There was a rather "very british" version of Split Personalities with Alan Sugar, Sir Clive Sinclair and Neil Kinnock as well as a "European" version in which they were swapped with Nelson Mandela, Gorbatschow and Helmut Kohl. The "European" version. The faces are Helmut Kohl, Margaret Thatcher, Neil Kinnock, Nelson Mandela, Mikhail Sergeyevich Gorbachev, [help please], Charles & Diana, [help please], [help please] and Marilyn Monroe. 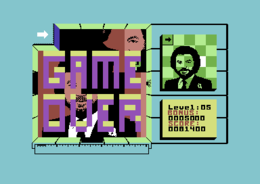 As it can happen any time that a bomb comes into the game area, it is advisable to always have two puzzle pieces next to each other in the upper right corner. If a bomb is thrown out it lands exactly below the lid at the upper border of the game area and can then most of the time be disposed of at the right time. It is recommended to solve the images from bottom to top to avoid having to push around at a later time. From level 4 puzzle pieces thrown back by sparks will push other pieces that are in the way, so that unwanted chain movements can happen. Less is more: If you fill all the screen with puzzle pieces you do not have to wonder if nothing goes any more. Therefore quickly throw out the pieces that you do not need yet to gain space. Robotron2084: "Split Personalities is for once a really nicely hectical puzzle game at which you can well twist the brains and also despair if the game does not want to spit out the right puzzle piece and instead serves you with bombs. At the same time it is never unfair, as each situation can be mastered with the right precautions against the omnipresent bombs. To keep this caution also within the tight time limit is far more difficult. Certainly not a game that you can play for hours (or should... think of your blood pressure!) but for in between Split Personalities is a fine thing. 7 of 10 points." TheRyk: "Welcome to the evil 80s! The irony and satire in this game are just hilarious. Graphics and music are alright for 1986, though there's no ingame music. It's kinda difficult and needs a lot of patience to learn some tactics for at least solving the first couple of pictures, before the fun really begins. Including cult and Cold War bonus I rate this 7 points." 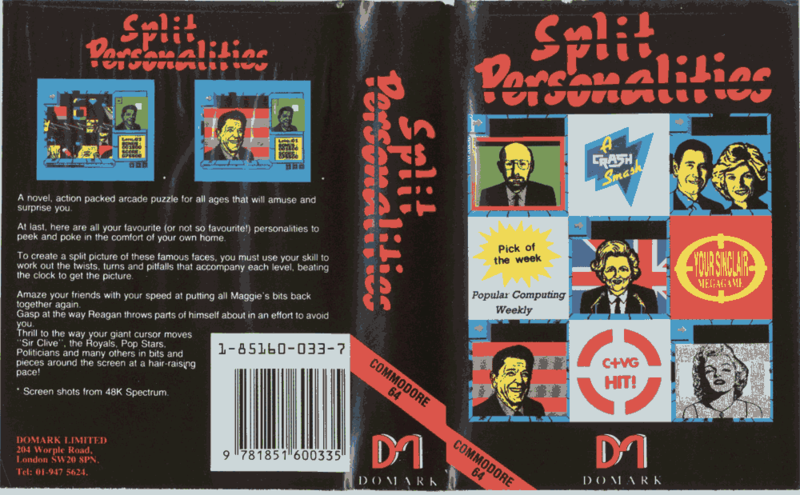 The game was originally named "Splitting Images" but was then renamed as the resemblance of the name to the British puppet satire show "Spitting Image" was too big. This page was last modified on 7 May 2018, at 15:47.